Men with high school diplomas are retiring around age 63 – three years before college-educated men. The gap in their retirement ages used to be smaller. The reasons behind the current disparity are explained in a review of research studies on the topic by Matt Rutledge, an economist with the Center for Retirement Research. The trend for women is similar, though their story is complicated by a sharp rise in their participation in the labor force in recent decades. Health. Older Americans are generally getting healthier and living longer – so why not wait to retire? Well, the health of less-educated people is poorer and has improved less over time than their more-educated coworkers. 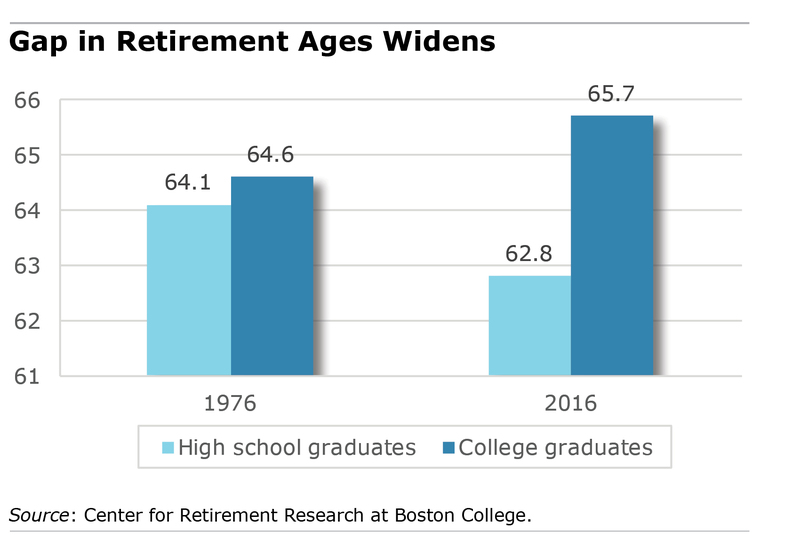 And health problems trump unemployment and other types of job losses as the single biggest reason for their early retirements – more so than for better-educated workers. Labor Market. Two aspects of the labor market are relevant to less-educated workers. In the past, a large share of the retiree population could count on a guaranteed monthly income from a pension. Today, the workers who have a retirement savings plan have an incentive to delay retirement, because they will have to rely on the often inadequate and uncertain income that can be withdrawn from their 401(k)s. But less-educated workers haven’t been affected very much by the change, because they’ve never been big beneficiaries of employer retirement plans. In the 1990s, they could claim just 11 percent of the value in pensions, and today they hold 11 percent of the wealth in 401(k) plans.